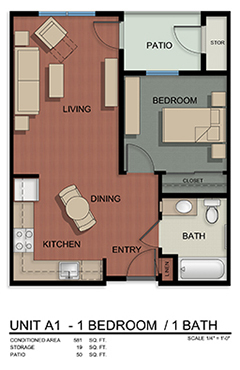 We have over 30 floorplans available. 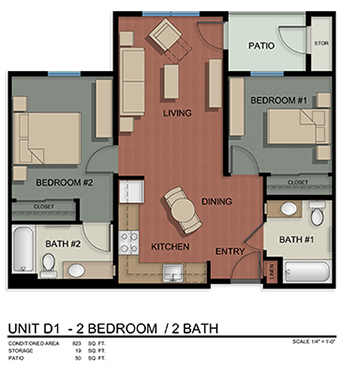 The two most common floor plans appear to the right; go ahead and click on one of the two diagrams on the right to see a larger version of the floorplan on your browser screen. You can choose from a one-bedroom, one-bathroom home or a two-bedroom, two-bathroom home. Each diagram shows the location of each room of the home, including your patio/balcony and storage area. Some of the rooms show you where you can place your furniture. As you'll see, each apartment is designed for the best use of space and livability.